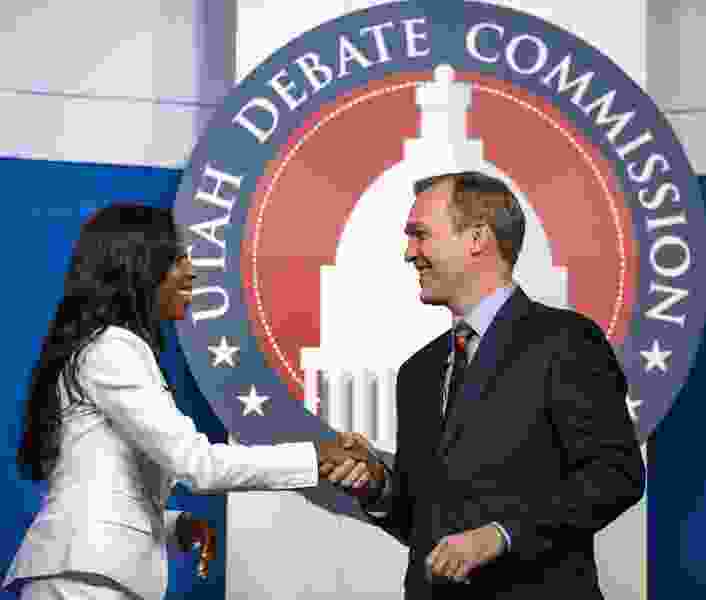 Mia Love, Ben McAdams talk about their get-out-the-vote strategy. Hint: To stop their robocalls and mailers, mail in your ballot. Tired of campaign robocalls? Sick of stacks of political mailers arriving every day? One easy step may put an end to them: Send your by-mail ballot, already. “That’s probably the best way to stop it, to be honest,” chuckles Dave Hansen, campaign manager for GOP Rep. Mia Love, who is in a tight-as-possible race with Democrat Ben McAdams. Campaigns buy updates every day from the state about who has voted — and remove those names from supporter lists they have developed over time. So only those who haven’t voted continue to be targeted with phone calls, mailers, door-hangers and visits by volunteers. Sorry, the TV and radio ads continue to go to everyone. The campaigns of Love and McAdams discussed some of their get-out-the-vote strategies Tuesday. Love’s camp talked more, while McAdams' people didn’t want to reveal too much about their endgame strategy. Now that it has those people targeted, she added, “We’ve now shifted into get-out-the-vote mode, phoning and knocking on doors, urging people to return their ballots and to vote. That will continue through Election Day. It’s a robust field plan, and we’re going after every single vote." Recent polls by The Salt Lake Tribune and Hinckley Institute of Politics and The New York Times have shown the race as tied. A KUTV poll showed McAdams up by six points. The FiveThirtyEight.com website that combines numerous polls gives McAdams a five out of nine chance of winning. But as McAdams said this week, the only poll that really counts is the one that culminates on Election Day, and everything depends on campaigns getting supporters to return ballots. A first step is identifying supporters, and Hansen said voters likely would be surprised about how much campaigns know about them — including how likely they are to vote, whom they tend to support and how to phone or otherwise contact them. “We use a modeling” with “perhaps 30 factors” on everything from age, gender, voter registration and voting history — with data from voting records, public records and data gleaned from donations, polling and other sources, he said. Love’s campaign looks “religiously” at daily reports on who has voted to help target remaining resources on those who have not, said Hansen. That includes tweaking lists for late mailers, phone calls, and visits by volunteers to drop door-hangers or make personal appeals to vote. He said by-mail voting has changed strategy. Hansen said he believes by-mail ballots will help Love this year. It is the first time they are being used in Utah County, where the former Saratoga Springs mayor tends to win by big margins. “It’s easier for people there to vote now,” making get-out-the-vote efforts a bit easier in a nonpresidential election. About 85 percent of voters in the 4th District live in Salt Lake County, home to McAdams, 11 percent in Utah County and the rest in other rural counties. According to data released Tuesday morning by the office of Lt. Gov. Spencer Cox, nearly 100,000 people have voted so far in the 4th District — about a quarter of all registered voters there. Among those voting so far are 45,470 Republicans, 33,396 unaffiliated voters, 18,128 Democrats and 2,520 members of other parties. Using breakdowns from previous polls about what percentage of each group supported the candidates (for example in The Tribune’s poll, Love had support of 75 percent of the Republicans and McAdams had 66 percent of the unaffiliated and 95 percent of Democrats), analysis suggests that McAdams may lead Love in early polling by roughly 47,000 to 44,000. And, he adds, the campaign will keep urging them to do so until the last possible moment.